Despite being the largest land animals, two species of wild elephant still have many mysteries. Even today, where you can connect with people across the world in seconds, where we have Google images of every corner of the planet, there are still unexplored mysteries. One of these mysterious species is the African forest elephant, recently declared a separate species in 2010. This is the species I decided to conquer (academically, of course) in 2006 when starting graduate school. Recently, the fruits of my efforts fully ripened in Endangered Species Research, where I published my final chapter of my PhD research, and the chapter where I unravel the secret friendships of forest elephants. In my second semester, I met Dr. Stephen Blake, formerly at Wildlife Conservation Society Gabon, and one of the top experts on forest elephants. He showed me a map of six elephants that have been collared with GPS units and tracked for nearly two years. 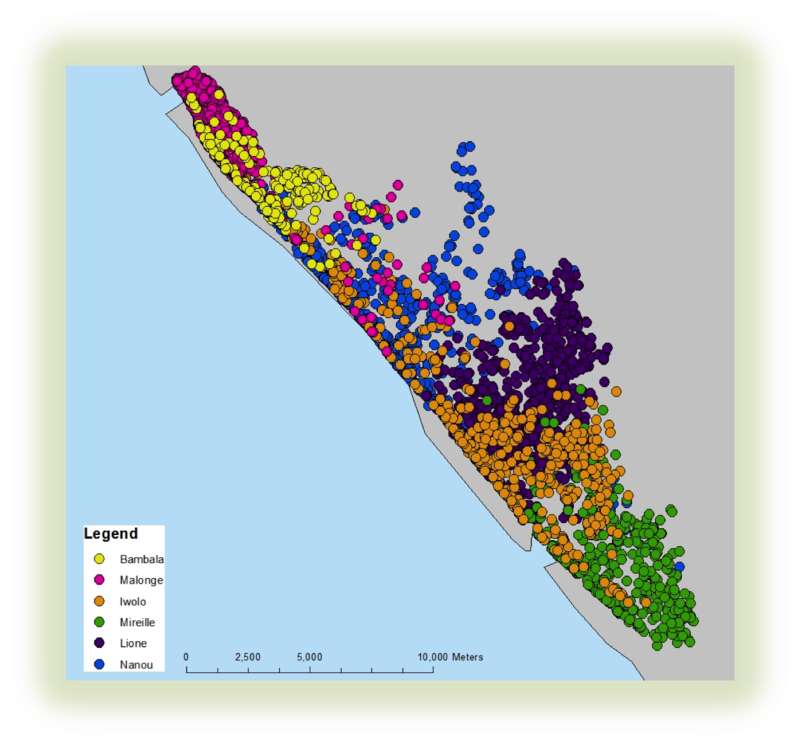 What was so fascinating about these locations is that they were all concentrated in certain areas meaning the elephants did not move much (One home range was 11 km2! ), but also they were not overlapping much. This was different than patterns I had seen in African savanna elephants. Were these elephants avoiding each other? I only had six elephants to work with from this study, so I needed more. 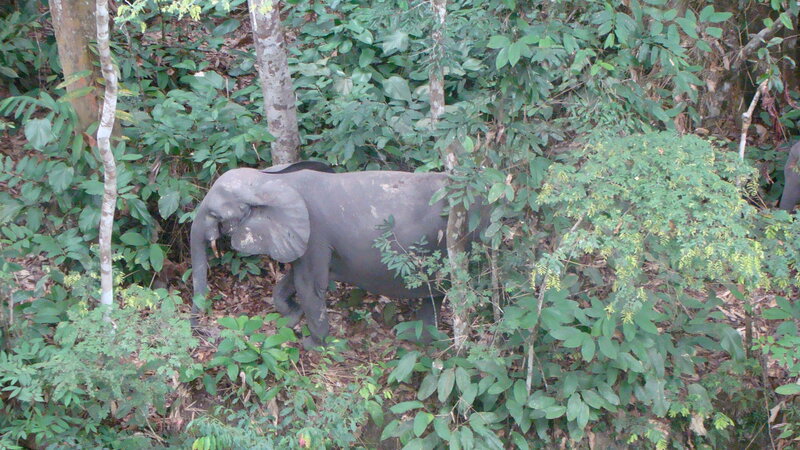 Raw location data from six GPS-collared female forest elephants in Loango National Park, Gabon. To address these questions, I needed to see how elephants interacted with one another on the ground. Adding more collars would be expensive, so I went to the field to conduct observations. I chose Lopé National Park, Gabon because despite being a forested park with forest elephants, there are also pockets of savanna clearings that you can see the elephants in. I looked for elephants in two ways. First, Jaque the carpenter (who sadly passed away in 2009) and field assistants built a platform roughly 20 m high at a clearing in the forest where elephants visit to dig for minerals in the soil. This was VERY high and the tree was straight up. I had to physically pull myself up the ladder. But it was the only tree in the area with a crevice where the platform could be built. The first day we started to build there were elephants already there! A great sign. Once I actually sat on the platform though, there were days with nothing. Every sound of branches crashing turned out to be monkeys playing. I also saw duikers and forest canopy birds, but no elephants. Then one day, they came. A female and a male calf perused through the area eating vegetation and fruits. I took hundreds of photographs of them watched over them without them even knowing. 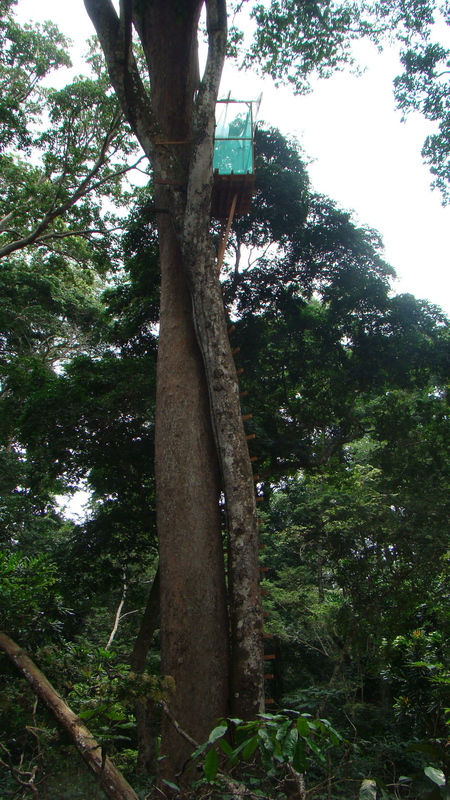 My platform to observe elephants, 20 m high. Spying on elephants from the platform. Unfortunately because I was in Gabon for such a short time and I saw only those elephants on the platform, I had to switch strategies. I used the savannas in Lope as a way to see the elephants. Driving around the park for hours each day, I scanned the savannas for elephants. Whenever I saw one, I stopped and took as many photos as possible. The photos can be used to identify individuals. The ultimate goal of the study though, was to not only get photographs of the elephants, but also collect their dung for genetics, which would be used to tell the relationships between individuals. This was the hard part. Elephants poop roughly 17-20 times a day; fantastic information for a geneticist using non-invasive DNA. When watching the elephants, I thought I would observe them defecating so much that it would be difficult to track which dung belonged to which individual. Not quite. Apparently, they are much more shy. I would stare at a group for nearly an hour and not see anything. Staying with a group for a long period of time meant that I might miss observations with a new group. Seeing more elephants and repeat observations of the same elephants meant more data. Even if I stayed with a group, and they left, I also had to be sure that they really left. The elephants in this park are aggressive, and going into the forest could mean that they are just within charging reach. Also, many elephants came out at dusk, therefore staying in the clearing until night. I finally accepted the fact that I would have to come and collect hours after a group left, even the next morning. My biggest concern was that other individuals might come to that area throughout the night and defecate. When I collected their dung the next day, I would be collecting from the wrong individual. To overcome this problem, I had to develop categories of certainty with the dung I collected. The first was high certainty; seeing an individual defecate and collecting afterwards. The second was probable, where I saw the same individuals repeatedly and was also able to collect dung from the group repeatedly. When analyzing the samples, I actually found them to be from the same group; I got the same microsatellite patterns of individuals! Lastly, I had a category of uncertain, where a dung sample was only collected from a group or individual once, and with hours afterwards. Another source of support was that when I was collecting for dung from where a group was, I mostly found that the number of samples was smaller than the group size I observed. Finally, with all of my observations and genetic information, I was able to put my networks together. Nicknamed “constellations of elephants” because of their broken, disconnected nature that made them resemble star constellations, I found that some forest elephants did have a large number of associations, much larger than any observation in the field, and that they tended to associate with kin, similar to African savanna elephants. But I also found lots of elephants that didn’t have friends; they were completely solitary. From these, the toughest part was finding out the “real” patterns. By having repeat sightings of individuals, we can be more certain that we have captured what represents their “true” sociality. However, most of the elephants that I saw were seen on average two times. I tried to look at patterns of connections between the individuals and observations to see if the number of observations had an impact on different aspects of sociality, but during one observation period, I found a group of 22 elephants! This group consistently altered some of these patterns, making it difficult to interpret the effects of repeated observations. Top figure shows forest elephant networks of all adult female elephants observed. 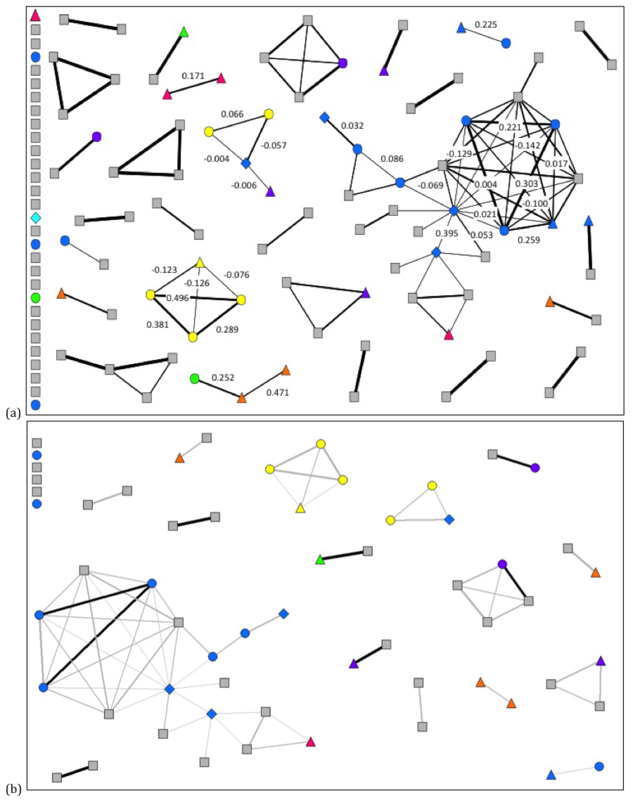 Bottom figure shows a network with individuals that were observed at least two times. In both figures, heavier lines correspond to the number of times individuals were observed together, colors represent mitochondrial haplotype, and shapes are the certainty of dung assignment (circle most certain, diamond probable, triangle uncertain). Numbers represent genetic relatedness. In bottom figure, black lines represent “best friend” elephants, where the association index is at least two times the average. Most importantly, forest elephants do seem to be different than both African savanna and Asian elephants. Asian elephants are similar to forest elephants in that they are more hidden in forest environments, but when their social networks were visualized, they were found to have much more extensive associations. When comparing the networks of the elephant species, there is less connectivity and associations in forest elephants, making them a more solitary elephant. I do think that it is important for this study to be replicated to see if other populations have similar patterns; sociality may vary with ecology – from differences in forest composition to differences in predator distributions, and also the impacts of poaching, with rates currently at its highest for forest elephants, is completely unknown.